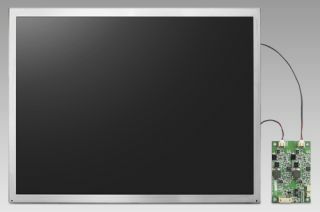 Advantech (2395.TW) has announced the launch of IDK-2000 series, 1200-nit ultra high brightness LED display kits. The Advantech IDK-2000 series extends the benefits of the current IDK series, providing a cost-effective display solution that offers maximum flexibility in mechanical design for customers, and compatibility with Advantech embedded boards and systems. Ranging from 8.4” to 19”, the IDK-2000 series comes with a 1200-nit industrial grade LCD panel, a LED driver board, and optional resistive touch screen integration. The IDK-2000 N series is a basic 1200-nit non-touch display kit model while IDK-2000 R is a resistive touch model. The new IDK-2000 series is 3 times brighter than the standard model, providing superior sunlight readability. Equipped with wide operating temperature support, the series is designed to be used for outdoor applications such as gas pump payment kiosks and vending machines. One major concern about high brightness is power consumption. Advantech is able to upgrade display brightness up to 1200-nit, with low power consumption, longer product life, and unchanged mechanical design. The Advantech IDK-2000 series uses a green LED light bar in place of CCFL as the backlight source. This, coupled with optical films, advanced reflection pattern design on light guide bottom, and special radiation technology enable 1200-nit with a low-power backlight source. Compared to traditional CCFL, LED backlight provides a mercury-free solution, better uniformity, and enhanced color contrast and saturation. The Advantech IDK-2000 series requires about 20% less energy than competing products with the same level of brightness. For example, a 17” LCD at 1000 nit usually consumes 35W while Advantech IDK-2000 series only consumes 29.47W, resulting in displays that run cooler with maximum reliability. In addition, the surface temperature of the LCD panel is below 40°C under turn-on conditions due to the low heating effect. Both IDK-2000 N series and IDK-2000 R series are available now.